we've been busy, busy, busy outside lately. the summer heat seems to be definitely behind us and the cooler weather has made darin restless and eager to get various projects underway. he pretty much single handedly built another raised veggie bed out of cedar planks (i held a few boards for him). it is now full of partly done compost with a few bags of dirt mixed in and a thick layer of chopped leaves and grass clippings. a few weeks of "resting" and it will be ready for fall / winter crops (to be named later). myself, i raked the whole front yard and then "vacuumed" the leaves with the toro leaf blower / chopper. and i cleaned out the driveway bed. still lots of fall cleanup to do -- clean up the beds in front of the house, add mulch to all beds, keep up with leaf raking / chopping. oh, and we (again, mostly darin) have started a raised bed across the back of the backyard. we have differing ideas of what will ultimately go there, but whatever it is it will be an improvement over the sad st. augustine. almost forgot the biggest project -- we took out two (smallish) trees in the backyard. the carolina cherry laurel and the white mulberry are history. the cherry laurel wasn't such a bad tree, but it was in a very bad place -- right against the back fence and directly under the power lines. while it wasn't up to the lines yet, it would have eventually grown into them and the power company would have come in and given it an ugly flat-top. it had very nice flowers in the spring, but then we spent the next six months pulling seedlings. the backyard neighbors were happy to see it go, too, since it also dropped seedlings all over their yard. the mulberry was just an ugly, trashy looking tree and i was very happy to have it finally gone. now there is a fair bit more sun in the backyard, offering many new planting possibilities. 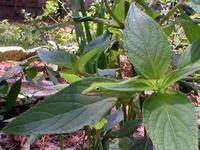 look closely to see one of the many anoles that resides in our yard. this one is perched on a pineapple sage (salvia elegans) in the backyard island bed. i don't know whether the local population of anoles has increased or i'm more attuned to their habits and hiding places, but i almost always see two or three or more each time i go outside. the carolina jessamine (gelsemium sempervirens) that i very nearly, almost killed earlier this year has rebounded admirably and now has four flowers. sometime next month it will be "graduated" from the current nursery pot to a new home on a trellis between the sunroom and the deck. i expect it to take a couple of growing seasons to properly fill the space, but once that happens, it should look very nice. one of the pictures i took today is in the garden gallery. three pentas (out of five or six) survived last winter and returned this summer, but only one has really thrived. the thriving plant is either the 'new look red' i bought in june 2002, or the unidentified red i bought in july 2002. whatever it is, it's been blooming profusely for the last couple of months. even though the plant is only a few feet in front of the tv room windows, the hummingbirds have been visiting it. frustrates the cats to no end to have an unreachable hummingbird at eye level. next saturday, september 20th, is the rose-ted pepper fest at the antique rose emporium in brenham, texas. Buy one rose and get one free - or - Bring any homemade dish with pepper included (hot or not) and get one free rose bush or a free bottle of Antique Rose Emporium organic liquid fertilizer. Taste Hatch Chili Stew and salsa while tasting local brew. i've never been to the antique rose emporium, but i understand it is one of "the" places to go for roses in texas. september has been a very damp month so far. according to the harris county interactive rainfall map we've had 5.35 inches of rain this month. the two volunteer fall tomatoes (located in the island bed) are thriving. i've staked them both, but i'm already falling behind with the pruning. the cooler weather has them blooming away and they've both set their first tomatoes. since these plants are volunteers, i'm not sure what variety they are, but at this early stage i'm guessing they are "matt's wild cherry". i suppose it's also possible that they're a cross between the "wild cherry" and the "sweet million". the two summer tomatoes are also appreciating the break in the heat and are growing madly. i'd much rather work at a nursery than have the headaches associated with owning my own. besides, in addition to the many large chain stores that carry various live plants and their accessories, there are also some very good smaller nurseries near us that offer a greater variety of plants (and much more knowledgeable staff). i just can't imagine trying to compete against all of them. late last week (thursday?) a very violent line of thunderstorms moved through the houston area and dumped ~2 inches of rain on our house. the flowers on the poor oxblood lilies did not fare well. they were too pitiful for me to even take pictures. then, to add insult to injury, when i looked at them yesterday i saw that one of the stems had been snapped in two and left lying on the ground. i suspect squirrels because there was evidence of squirrel digging activity in the mulch around the lilies. i hope the stem tasted awful. oh well, they were lovely while they lasted. now, hopefully, they'll put up some leaves and get to work making offsets so i can have a better show someday.